Buying property in Turkey for foreigners is a very easy process with TERRA Real Estate and its extensive experience and knowledge in Turkish Real Estate Market. It is naturally not very easy for you to know where to buy and which properties represent a good value, investment can be time-consuming and confusing, challenging especially when you are buying a property abroad. But don’t worry TERRA Real Estate is here to guide and help you throughout the whole process. Our step-by-step guide about buying property in Turkey will guide you through the entire process, from searching for the ideal property to ensuring the paperwork is in order and closing the deal. Here we explain step by step all you need to know about before/while/after buying a property in Turkey. Foreign nationals and Turks living abroad can easily access a wide range of Non-Resident Mortgage products both for residential or investment purposes. TERRA Real Estate in cooperation with some of Turkey’s high-street banks will be glad to help you to search and get a mortgage in Turkey. Foreign nationals can get mortgage from the Turkish Banks up to % 60-70 of the property’s appraised value and are arranged in Euro, Dollar, GBR or Turkish Lira. We recommend searching mortgages before coming to Turkey, so that you know exactly how much you need to spend on your dream villa or house. We also help our clients to make an installment payment plan with the construction companies if desired. Find out more about mortgage and finance in Turkey. TERRA Real Estate assigns a sales agent when the clients send an inquiry via our advertisements, website, property portals, sales partners etc. All of our real estate agents are highly skilled multi-lingual professionals with a good experience in real estate market. The same sales agent will be your contact person through the whole buying process. Our estate agents pick the clients up from their hotel or accommodation, show the properties that they want to see. Our estate agents will always accompany the clients, if they wish with our comfortable car. We will never be pushy on you and we will listen to your wishes, requirements and try to find the perfect property in the Turkish Riviera. If you choose some of the properties, our agents will check whether the property have a debt or taxes or not. When you reach agreement to buy a property, developer of the project is also invited to our office and a purchase contract is prepared according to the property details and your wishes can be added upon the approval of the construction company. We have sales contracts prepared by our lawyers, in Turkish and English (desired language can be added) and we will explain all parts and details before we all together sign them. The contract will be signed by the buyer, the construction company and us (TERRA Real Estate). The contract will be in Turkish, in English and of course if they want in the buyer’s mother language. After signing the contract, the buyer will make a down payment (deposit) that is usually of 10-15 % of the agreed purchase price. The buyer can make a payment plan after signing the sales contract with the developer and can transfer money the developer’s bank account. The remaining payment of the property is paid as part of the take-over process. If the buyer wants, we can ask the developer to offer a good payment plan. To buy a property in Turkey, you need to have a Turkish Tax Number. Our sales agent will help you get Turkish Tax Number from the Tax Administration Office. You need to open a bank account in Turkey to make money transfer, pay taxes and the utilities and etc. Your assigned sales agent will help you to open a bank account in Turkey. Annual property tax is approximately 40–50 Euro. Electricity and water subscriptions is approximately 150–200 Euro. Depending on the facilities and number of apartments in the complex, maintenance fee is between 30-50 Euro. We do not charge any commission from the new properties since in most cases, it is paid by the seller or property developer. However, we charge only 3% commission from resale properties, as all Turkish agencies do. In most cases it is included, if not our agent informs you when viewing the property. 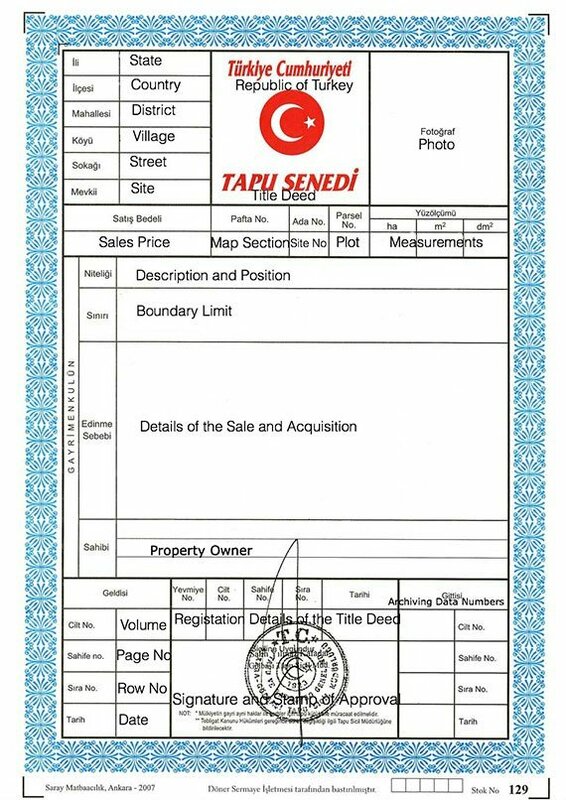 Tapu is an official document that shows your ownership over the property and is issued by Landy Registry Office. It is the most important document since it is the proof of ownership of the property. Iskan is Habitation Certificate that includes all technical information, approved by the State Committee in the local Municipality. At mentioned above; the buyer can give Power of Attorney to make new subscriptions of water/electricity/gas and follow the procedures related to the property. Our assigned real estate agent will help you to make subscription of electric, water, gas, telephone, internet etc. If you buy a property that is under-construction, our company will always update and inform you about the development, send you updates; photos and videos about the project status. The construction companies that we work for years are committed to their job and deliver the key on time. If you a special request regarding the interior design, furnishing and furniture, the developer company will be glad to help you. We will accompany the buyer to see the properties, surrounding area and take note of your wishes, requirements, (If there is) places to be furnished or designed and ask them to do properly. We inform the buyer when we found faults and defects that they have not discovered and ask the developer to repair/furnish/fix it. Do not forget that we are always on the buyer’s side. The brand-new apartments will be ready to move in. Apartments used before will be ready to move in also, yet if the buyer have a request to be furnished/designed we will ask the developer to make them in one or two days after signing the contract. We will add those issues on the sales contract. You always welcome to us to drink a coffee in our office after you move in your dream home. TERRA Real Estate cooperates with the well-known furnishing companies in Turkey such as Moda Life, Koleksiyon, Alfemo, Doğtaş Beko, Vestel, Yataş, Bellona and etc. Since we have contracts with them and work with them for years, they make good discounts to our customers. The buyer will choose the style, furniture and the furnishing company will deliver them whenever the buyer wants. As most of the properties in Turkey are freehold properties, there is no restriction for letting the properties. You can let your property how long you want to anybody you wish. TERRA Real Estate can re-sale your property that you bought. Since we access to a huge market and good local partners in the region, we can easily sell your real estate in a few days. TERRA Real Estate is a member of the Association of International Property Professionals (AIPP) assuring you that we operate with honesty, integrity and transparency. We have been working with Turkish construction companies/property developers in Turkey since 2004 and have a good experience of selling properties to foreign nationals. Our company TERRA Real Estate is the market leader especially in selling villas and sea-front apartments in Alanya. We advertise on the UK’s leading overseas property media “A Place in the Sun” and “Zoopla”, a number of portals in Scandinavia and Turkey’s most popular real estate portals. Our website is in 7 languages. Manually edited and translated. We have an online chat support for our clients to get an answer about the property listings instantly. The property prices are listed in TRY, EURO, USD, GBP, TRY, SEK, DKK & NOK. Built on the latest technology meeting the latest requirements of the modern world and hosted globally with CDN. We spend a lot of time and energy to keep it up to date every day. We have partner companies in USA, England, Germany, Sweden, Norway, Cyprus and Spain. Not only the landlords or the property developers but we have a wide local network of private property investors and estate agents. In most cases we can access most properties in the market even if they are not listed with us if they do fulfill our requirements. Do you still have Questions about Buying Property in Turkey for Foreigners?